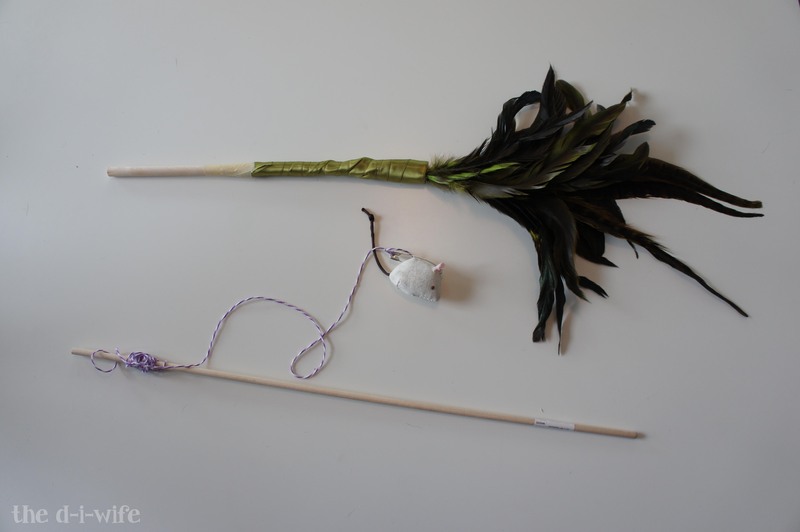 To start, I took measurements. 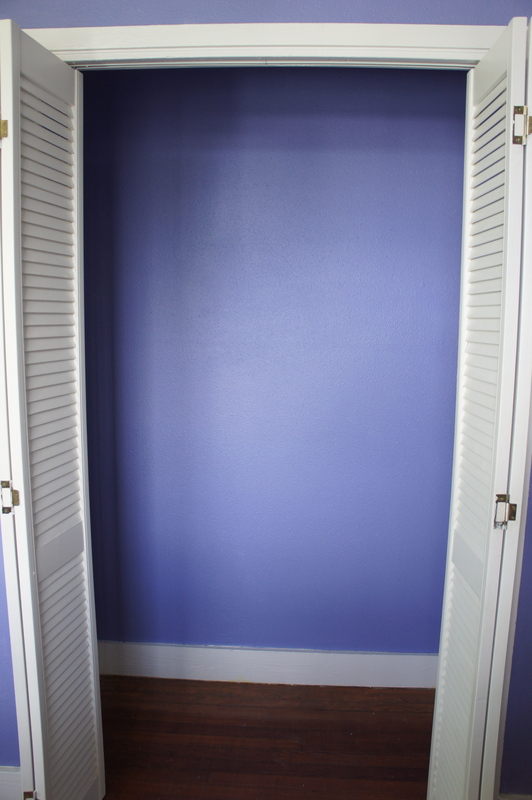 The height, width and depth of the closet itself– which came out to 68″ wide, 100″ tall and 24″ deep. Pretty reasonable. 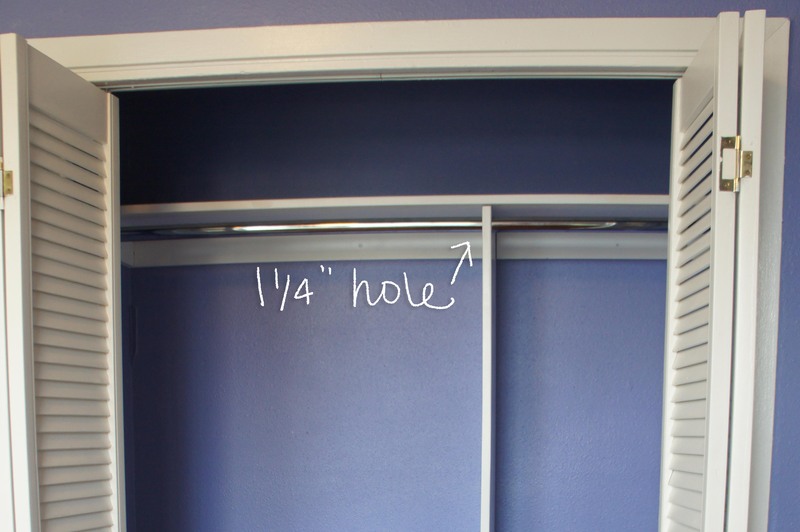 Then, I measured how much space each type of clothing I needed and planned accordingly. 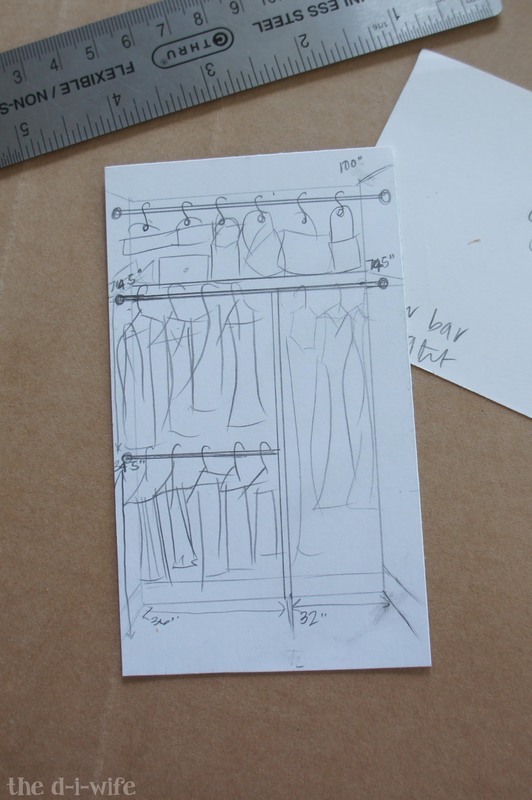 I went with 22″ for dresses and 36″ for my double-stacked racks of tops and bottoms. In hindsight, I should have spared like four more inches from the tops/bottoms side and given more room to my long portion. I went with two chrome rods, one was 72″ and the other 36″ and the nice people at the hardware store cut it down to size for me. Keep in mind, I chose chrome because, well, it’s pretty. But frankly, I spend about $30 more than I needed to if I had gone with another type of rod. But because I wanted to show it off on these here internets, I splurged. So, it’s up to you, lovelies. *Don’t forget to account for the size of the hardware and cleats. Can be found in both the closet and bathroom sections of your local hardware store. Pine boards come in different qualities and are priced accordingly. Nice pine is smoother, has fewer knots and is less warped. The lower quality variety is rough to the touch and you have to inspect all the boards to find the least-knotty and least-warped ones in the pile. No bigs though, nothing a little sanding can’t solve. The pine at my local store came in a variety of lengths but only a few depths, 6″, 8″ and 10″. I went with two 72″ x 10″ boards for the horizontal shelves of the cheaper pine and one nicer quality at 8 feet tall by 10″ for the vertical divider. To anchor the new bars, you’ll need some strips of 1×4″ pine to screw into the studs. I bought 1 x 3″, but I should have gotten the wider size to account for the size of the rod holders. This is why you let me make the mistakes for you. 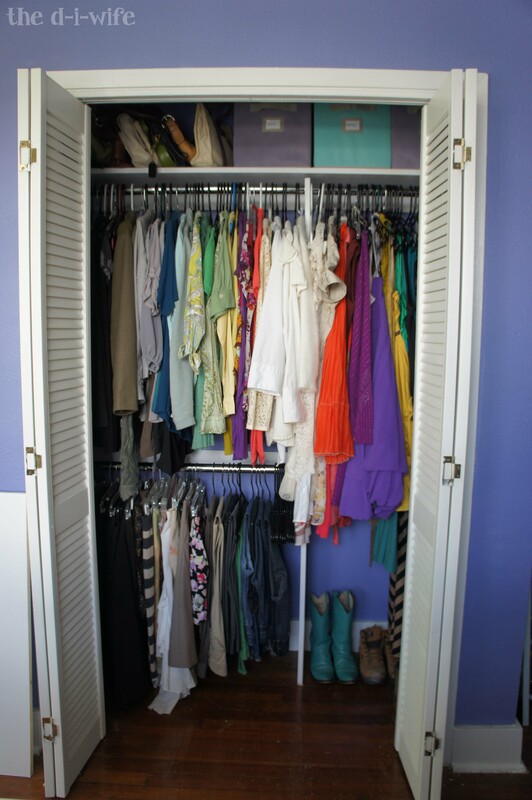 Get enough to go along the perimeter (except for the opening) of your closet. I got a pint of semi gloss white paint and that was plenty. You could probably get away with just a couple sample jars of your preferred color. A small roller and tray will be just fine. Take everything out and get ready to paint. This means removing any existing hardware, sweeping and wiping the dust off the baseboards (you don’t want that stuff getting mixed up in your paint.) 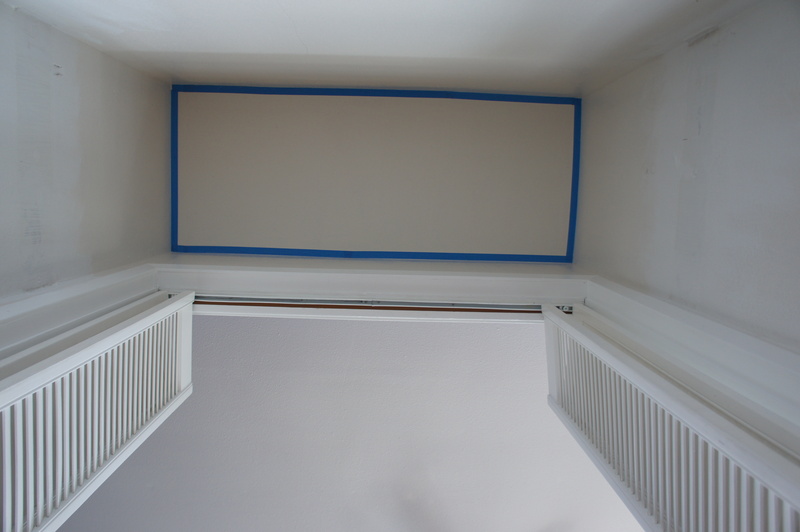 Tape off your baseboards, trim and ceiling. I like to use kraft paper as a drop cloth because I can fold or cut it to the exact size and it doesn’t get all wrinkled up under my feet as I work. 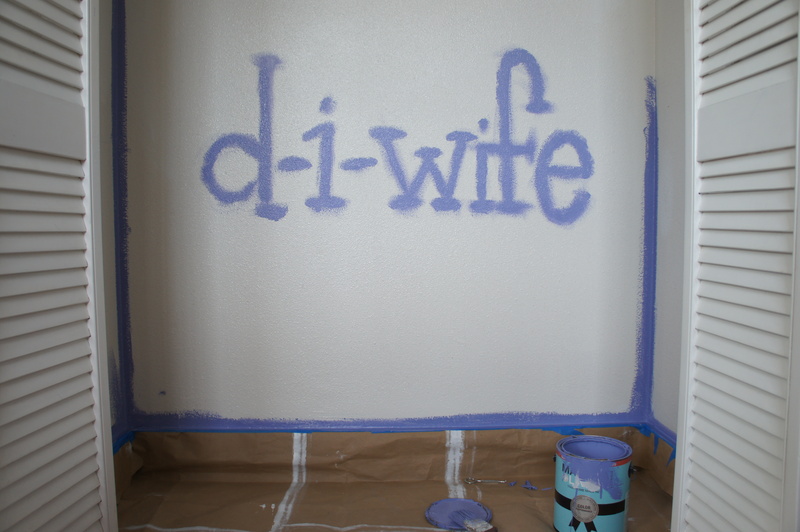 Start by painting the edges and corners. The trick to a nice clean line when painting along tape is lightly brushing a small amount of paint first, letting it dry then going over it with a thicker layer. This locks the line between the paint and tape with out any paint seeping through the edges of your painters tape. Then, go nuts. Using a palm sander, smooth down all your pieces. 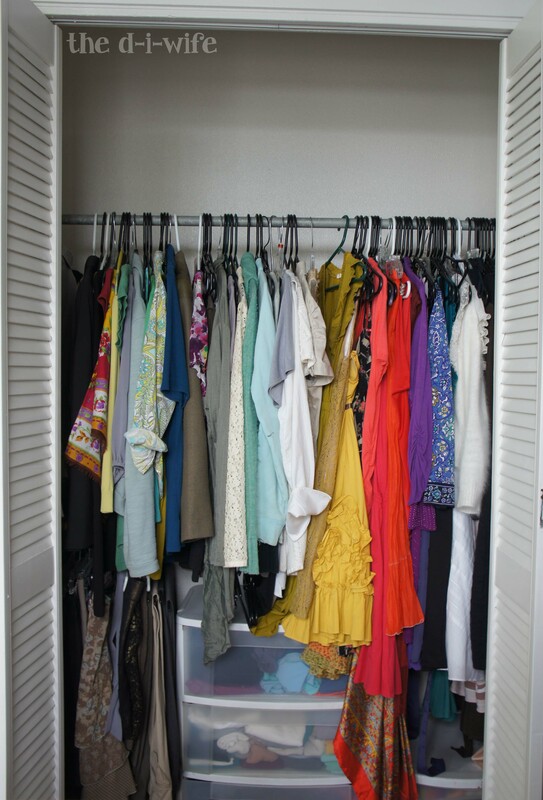 You don’t want any of your beautiful garments to get snagged on the closet where they live. Start with a coarse grain (the lower the number, the coarser the grain), I used 100 grit to start and worked my way to a nice smooth 250. Keep going til it feels like butta. Using a brush, prime the wood. I used good ol’ Kilz to make a nice finish for the paint to adhere. This is a totally optional step. As landlords, we always have a gallon or two of Kilz on our hands. Paint your pieces using a small roller. A couple coats should do just fine. Let dry for an hour or so, depending on how hot it is outside, you may be able to get away with less time. But hey, nothing like letting paint dry while you cool dem heels. Install the new rods, I did an extra one at the top to hang purses on hooks like I saw on pinterest, then one at 74.5″ high for shirts and dresses, and the bottom one at 34.5″ for pants and skirts. Since your cleats are installed all nice and level and you cut your shelves oh so perfectly, the shelves should just sit snug on top. *If you live in an old house like ours, and I don’t know, maybe the your house might be sinking after nearly 100 years of being on Southern silt… then level may be more like “level.” Oh, also our walls kind of curve. Hooray for added challenges. That being said, there was some cursing and re-cutting in order to make all my pieces fit just so. But then, once you’re all done installing the cleats, shelves and rods you can go put all your pretty things away! I’m a big fan of color order. For me, it’s the only way I know where anything is. I got some cute bins for belts, scarves and small purses to go at the top. I have yet to find shower curtain hooks that will fit my big chrome rods, so that’s why all the purses are snuggling up on each other. Still way better than the hot mess of piles they were in before. This is the part where I just stand and stare at my work. This step usually involves a glass of wine. 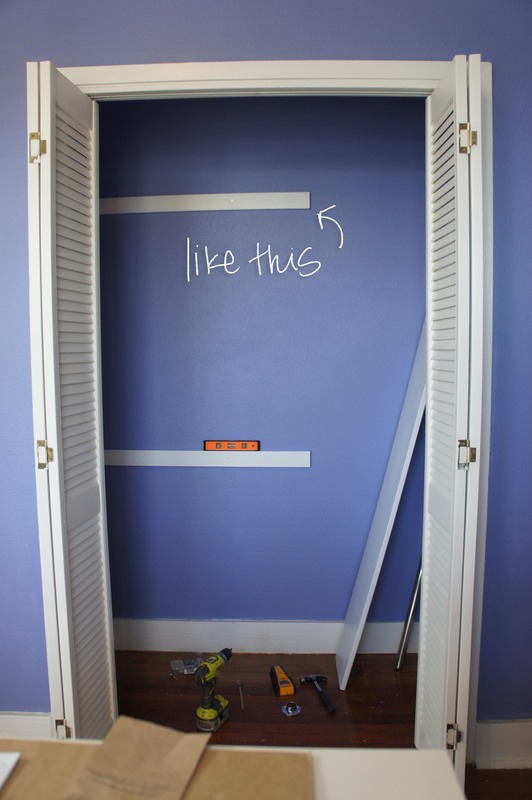 Posted in Carpentry, Uncategorized and tagged carpentry, clothes, diy, fashion, organization. Bookmark the permalink. Ok, so I’ve had this blog registered and sitting here for months. You know why? Because the first post is the hardest. It’s scary. It’s like “here’s what this is gonna be about and if I stray from this thesis I’m gonna feel weird about it.” Right? Well, that sounds pretty intimidating, if you ask me. Let’s just discover things as it goes along and see what unfolds. 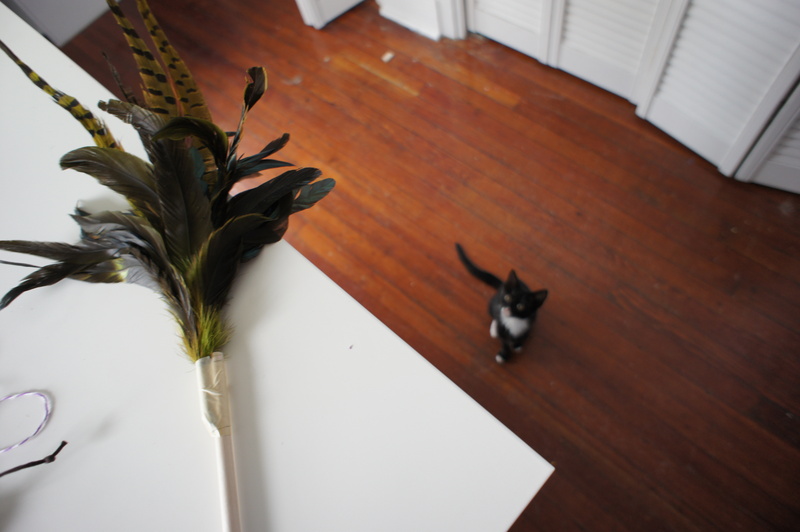 Crafting, cooking, carpentry, and maybe just a little bit of magic are a few things that you can expect here. There, I said it. That wasn’t so hard! I don’t know much about gardening, welding or how to use a sewing machine, but I can’t wait to learn! And when I make dumb rookie mistakes, I’ll let you know what pitfalls to avoid. I think we live in an overly consuming culture and we spend a whole lot of money on things we can make ourselves. Trust in your hands. 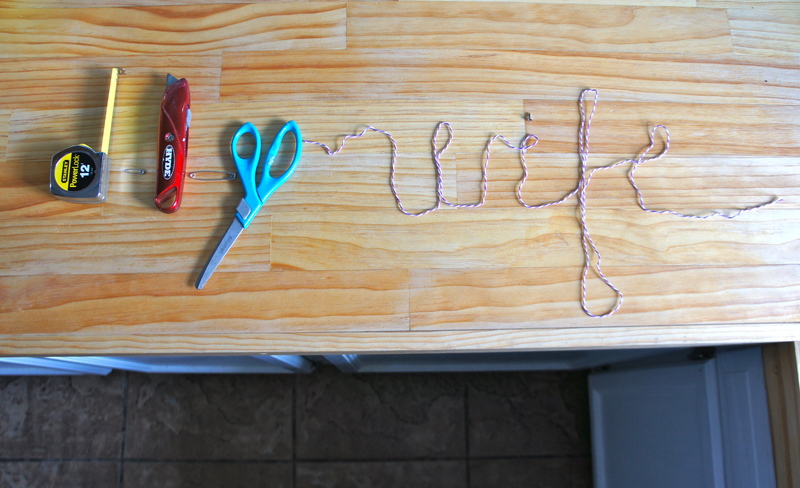 Let’s put the ‘do’ in domesticity. Posted in About and tagged carpentry, consumerism, cooking, crafting, diy, domesticity, manifesto, thesis. Bookmark the permalink.